On arrival in Delhi, you will be met by an Indian Profile representative who will facilitate your transfer to the hotel. Relax for the remaining part of the day and stay overnight at the hotel. As part of the Elephant Safari Tour with India Profile, enjoy a morning city tour of New Delhi. Visit attractions like the Laxmi Narayan Temple and India Gate besides driving past the Parliament House. Enjoy a sumptuous lunch before visiting other attractions like the Jama Masjid, Red Fort, Raj Ghat and the Chandni Chowk. You will also enjoy a sound & light show in the evening. Stay overnight at the hotel. Travel to the famous Jim Corbett National Park in the morning. Check into a hotel on arrival and rest awhile. After lunch, explore the jungle on jeeps and in the process acquaint yourself with the rich flora and fauna of the Corbett National Park. Return for an overnight stay at the hotel. Early in the morning, drive to Durga Devi and indulge in a full day elephant safari in the jungle. You will also be provided with packed lunch during your elephant safari. Later, process to Lohachor for dinner and an overnight stay. Enjoy a scrumptious breakfast then proceed for another full day elephant safari. You will be provided with packed lunch during your safari. Arrive at Ratwadhap for a hot dinner and overnight stay. On day 6 of the Elephant Safari Tour, have an early breakfast before proceeding for a daylong elephant safari with packed lunch. At the end of the day, drive to Haldupura for dinner and an overnight stay. As part of the India Profile Elephant Safari Tour, enjoy a Jeep / Elephant ride in the morning before returning for breakfast. Relax for a few hours before driving back to Corbett. Stay overnight stay at Corbett. An early morning drive will take you to Delhi. Check into a hotel on arrival and spend the remaining part of the day at leisure. You can either visit the entertainment hubs of Delhi or indulge in some last moment shopping. Stay overnight at the hotel. On the final day of the Elephant Safari Tour, transfer to the airport to board your return flight back home. 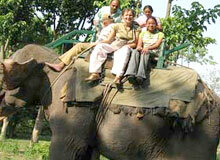 India Profile offers online bookings for its Elephant Safari Tour Packages.